Vegetarian and vegan: How do you eliminate meat from your diet? How Do You Become Vegetarian if You Enjoy Eating Meat? 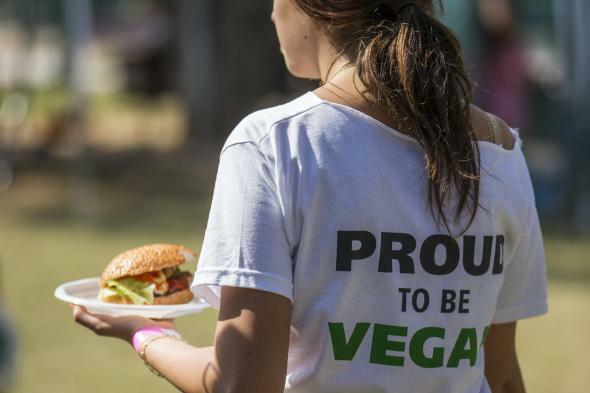 A woman carries a vegan hamburger during Vegan Fest on Oct. 13, 2014, in Ramat Gan, Israel. Here’s the thing: You’re already a vegetarian. Well, a vegetarian plus, but you eat all the things vegetarians eat already. So now you have to find out what it takes to eliminate the things they don’t. First, don’t feel pressured to go from socialized omnivore to vegetarian in a heartbeat. You’ll make mistakes—getting the bacon smoothie or digging in at a clambake. Here’s the fun news: No one will take away your vegetarian card for lapsing. Not at the beginning, and not later, though it will get easier as you develop new habits and likes. You say you are morally opposed to the eating of animals. Good. Don’t do it. As in: When you have a choice, don’t do it. Now find those choices. Most restaurants have amazing vegetarian dishes along with their standard omnivore fare. Most supermarkets sell you everything you need to become a healthy vegetarian eater. And here’s the kicker: If you ever slip up, you don’t automatically go back to being a meat eater. I went vegetarian for a year and vegan (dietary—you’ll pry my leather boots from my dead feet) for three months out of that. To me it wasn’t about the animals; I just felt that I’d treated side dishes always as an afterthought, and I wanted to make them the star for a while to learn how to make them better. I fell a few times in the beginning—a clambake, the Texas State Fair (mmmm, deep-fried chocolate-covered bacon), and some other events. But all in all, I cut my animal consumption down to about 5 percent, which is, no matter if you want to learn to cook vegetarian better or have a moral objection, a huge win. Also, find things that excite you as much as meat. I found that German Semmelknödel, fried and served on a white sauce and mushrooms, filled me more than any steak could and were tastier than most steaks I’d had in my life. I realized that an olive salad with spicy leafy vegetables was just what hit the spot where I’d previously had my chorizo and spicy lengua. And, finally, don’t ever try to become anything you aren’t. You’re a vegetarian already; you have your moral objections. Now all you need to do is allow them to become part of your dietary choices. Don’t feel bad for not going the full Woody Harrelson on Day 1, but remain true to your convictions without beating yourself up for lapsing. You’ll soon have no problems living the veg life. Eating: Which countries have the best street food? Vegetarianism: What does science say about vegetarianism?